Get a double dose of awesome with a MasterCard® credit card from Blue Ridge Bank. The flexibility that MasterCard® provides is already great, but when you add rewards to the mix — who could argue with that? Not only can you make purchases virtually anytime, anywhere, you also get rewarded for doing so. Receive 1 point for every net $1 spent — redeemable for value-packed prizes. All backed by competitive rates, no annual fee, and enhanced security features. One tiny card, so many possibilities — that's the power of MasterCard®. Enhanced security, including zero liability policy and identity theft assistance. 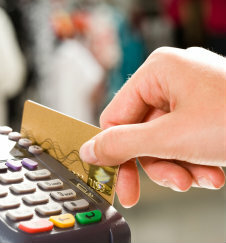 View our MasterCard® Platinum Personal Credit Card FAQs. Enjoy enhanced purchasing protection by signing your card up with MasterCard®. You will be issued a unique password — one that must be used in order to complete an online transaction. Sign your card up today. *Airline tickets good on any airline with no blackout dates.